Ho-ly Mackerel, this is incredible. 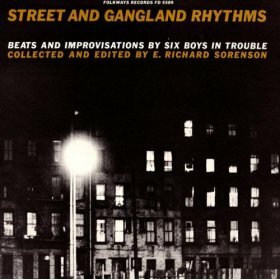 Street and Gangland Rhythms: Beats and Improvisations by Six Boys in Trouble is a 1959 urban field recording LP from Folkways Records, a pioneer in folk music, field recording, and world music. A rare record dealer has an original LP edition on eBay right now, “stone mint and in the shrink,” but Smithsonian Folkways also publishes most of the company’s archives either digitally or on CD. Buy the mp3 download on Amazon for $8.99. Author gregPosted on November 14, 2007 Categories etc.